This one was a lot of fun to make. The reason I based it on 3 was because after trying prime and Fibonacci number sequences, I wasn't happy with how the looked. So a little more research popped up that a lot of close encounters involved the number 3. Do I believe? I try to keep an open mind. I listen to Coast to Coast AM every night while I'm going to sleep. 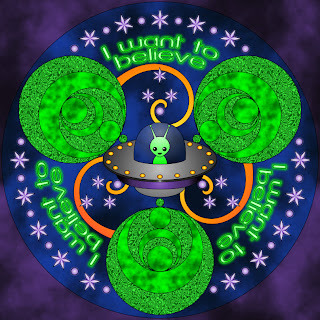 Like Fox Mulder, I want to believe. The crop circle designs aren't an exact copy of any crop circle that I know of, but they are inspired by the elegance of the crescent designs that have popped up. The friendly alien is because it's seems rude to assume a threat. Maybe they just want to borrow a cup of sugar? It's whimsy. Not a statement of my beliefs, or meant to insult anyone else's beliefs. It's fun, and I hope you like it! Click on the image to download the full sized version. You can also use this design for embroidery, pyrography or any other crafty uses. I think it would look wonderful embroidered using glow in the dark flosses and I'm thinking of doing that myself. Font used is Street Expanded by Graham Meade. oooh! this is so fun!